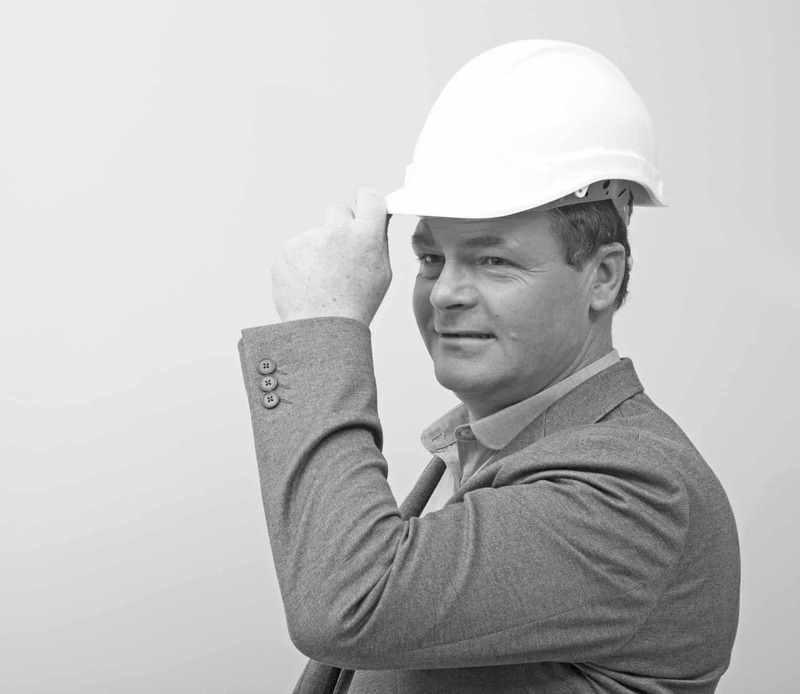 At John Webster Architecture we want to help you navigate ‘hassle-free’ through the process of building an extension. We want to do this by providing you with information that helps you fully understand the process of a construction project and how much it costs before design & construction work starts. What is the cost of building a House extension in Dundee & the surrounding area & what can influence this? You love where you live, the kid’s school is just around the corner, shops are close by and the park is on your doorstep, what more do you need! 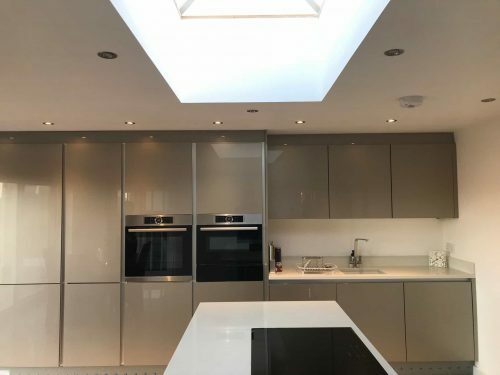 You could do with a bit more space though, maybe a large family dining kitchen is on your Wishlist, so You’ve been thinking about building an extension for some time…. but here is the 6-million-dollar question. How much will a house extension cost? What do I get for my money? These are the questions almost everyone will ask when they are thinking about building an extension of any kind, after all, it’s a big deal, you want to make sure that you can afford it! To that end, we highlight 4 big influencers on the cost of building your extension & give you realistic construction costs per m2 for the locations that we operate in. House extension cost in Dundee and beyond! Well, to be fair it is a very broad question, to illustrate it’s a little bit like asking how much a car costs, what kind of car? A Fiesta or a Bentley with an options list as long as your arm, Both can get you from A to B, but one costs £10,000.00 and the other £100,000.00. Let’s dive a little deeper into what can influence the cost of an extension to your property. Poor Soil conditions may mean engineering foundation design to suit, which will be more expensive than regular foundations. Can a digger get into the site? if not it will need to be hand dug, this is labor intensive and will cost more money. Will an existing extension or structure need to be demolished before your new extension can be built? This will need to be factored into the cost along with skip hire or removing waste from the site. If Asbestos is present a specialist contractor can be hired to remove this within HSE guidelines. Windows and doors will impact the cost, with bespoke & triple glazing costing significantly more than ‘of the shelf’ windows and doors. The construction method of your new extension will be a determining factor in cost, for example, a simple timber kit extension will be cheaper to build than say a more complex method with a steel frame and frameless glazing. These are some of the major influencers to the cost of your extension. Therefore, it makes sense at the very beginning of the process that you & your architect or Designer have an honest & open talk about your budget, as they can guide you at this early stage and let you know what type/size/spec of extension that you can expect to get for your money. Budget & its importance cannot be overstated, if nothing else but to avoid disappointment, there is little point in the Architect designing something that you cannot afford to build. If you are thinking about building an Extension to your home in Dundee, Fife, Perth or Angus the table below will give you a realistic indication of the costs per M2 for 2018 in the areas that we operate. House extension costs can vary dramatically depending on your location. On the east coast, Edinburgh has by quite a margin has the highest house extension costs. One way to keep building costs down and getting the best value is to obtain at least 3 like for like quotes from builders. This way you will get a good spread of costs and this will allow you to pick, not necessarily the cheapest but the best contractor for your project. EDINBURGH CITY & EAST LOTHIAN. The m2 cost is for a finished building, however, this generally does not include the cost of kitchens and bathrooms as these can vary so wildly in price. A kitchen can cost £5000 or £50,000 it really comes down to your budget. As every project is unique it is a guide only and exact figures cannot be attained without accurate drawings and specification. Your Architect or Designer will be able to assist you with this and obtain quotes from suitable contractors. *The Building warrant fee is payable to the local authority and is directly related to the cost of the works, current Building Warrant fees can be viewed Here. Keep in mind that this is set by the Scottish Government and will apply to all Local authority areas in Scotland. A 10% discount is given when an SER certificate is submitted. 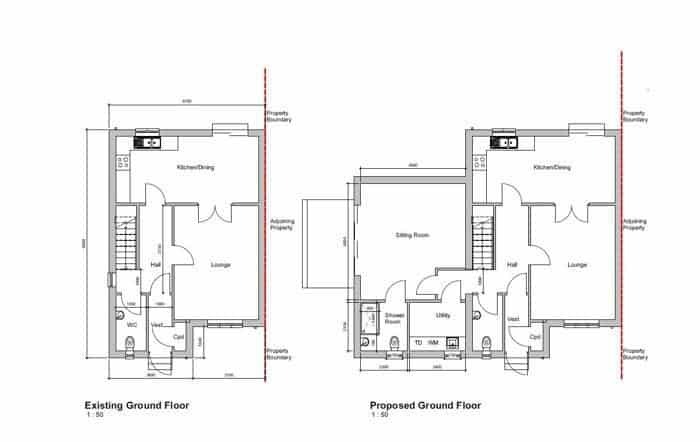 7.5 m x 4.5m single storey extension incorporating a sitting room, utility room, and Shower room. The costs are based on 1 main contractor and full site supervision by John Webster Architecture. Construction cost 34m2 – £50.459. Single Storey that has almost doubled the size of the living area=total cost £5o,459. VAT is included in this figure. So, there you go, hopefully, this has helped you to see what you can get for your money.